This is it, guys, it's time for Apple to announce the latest iOS platform - iOS 7! We've been waiting for this one for quite some time, as you probably know that it's expected to be quite the revamp. Now headed by Sir Jony Ive, Apple's hardware design guru, iOS 7 should have a more simplistic look, but at the same time we also expect that it'll offer many new useful features. After all, looks are not all, right? Stay with us, as the event is scheduled to kick off at 1PM ET | 12PM CT | 11AM MT | 10AM PT | 5PM GMT | 7PM CET! 14:02 That's a wrap, guys, stay with PhoneArena, because we have more amazing iOS 7 coverage coming up! 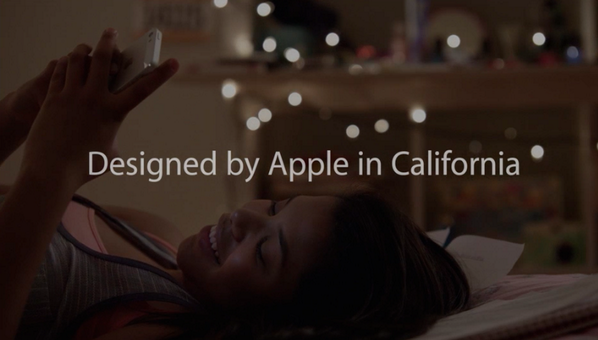 14:01 They are now rolling a new Apple ad." Emotional as always. 14:00 iOS 7 is coming this fall (with the new iPhone, we guess). 13:59 "I'd like to close this morning with a reminder that our goal at Apple is to create great products that customers love." 13:59 "We're incredibly proud of all these products. They are great examples of what Apple does best," says Tim Cook. 13:58 iOS 7 is coming to iPhone 4 and later, iPad 2 and later, iPad mini, and iPod touch (5th gen). 13:57 Developers are lucky, because they get access to iOS 7 beta today. 13:56 Notification sync, FaceTime audio, Activation lock, Per App VPN, Tencent Weibo, Message blocking and more are all new iOS 7 features. 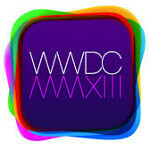 13:54 iTunes Radio will be built into every iTunes version out there, for any device. It'll be ad-supported, and available in the US initially. 13:52 But of course, there will be many predefined ones. 13:52 Users can create their own stations in iTunes Radio. 13:51 Eddie has announced iTunes Radio! 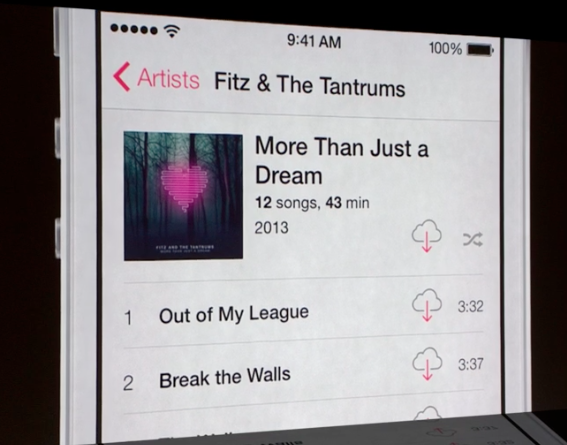 It'll be integrated with the Music app. 13:49 Apps will update automatically in iOS 7. 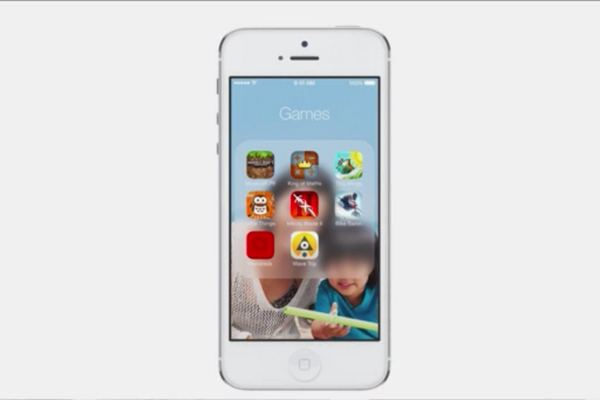 13:49 App Store is getting a new Popular Near Me function - giving you relevant apps to your current location. 13:47 iOS in the Car is the next big feature Cue will talk about. 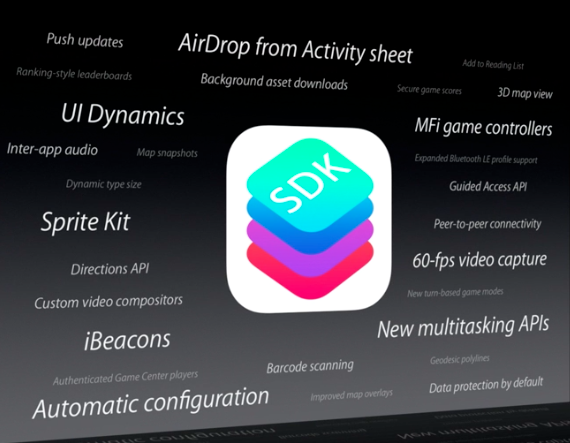 13:46 New system functions will now be added to Siri, like "Turn Bluetooth on", or "Increase my brightness!" 13:46 These new voices will also be available in French and German, with more on the way. 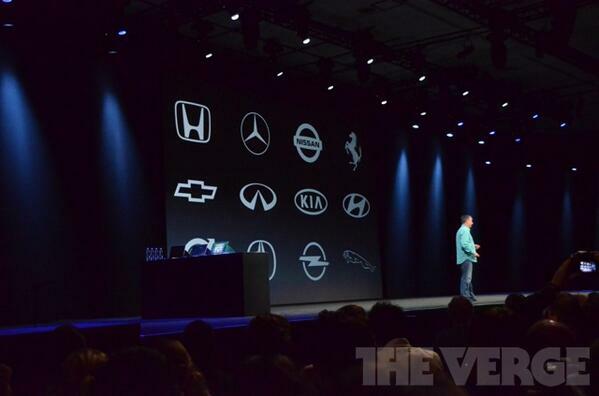 13:46 Eddie Cue is on stage to talk about iOS 7 sevices. Starting with Siri - it has an all-new voice (male voice is available). 13:45 iCloud Photo Sharing now supports video. 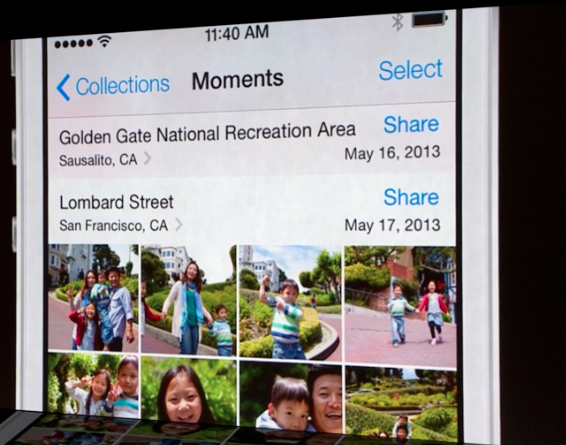 13:41 Photos in iOS 7 will be able to organize your photos in "Moments." 13:40 The new camera app will feature photo-filters to make Instagram somewhat unneeded. 13:39 Great way to share content! 13:39 AirDrop is supported by iOS 7. 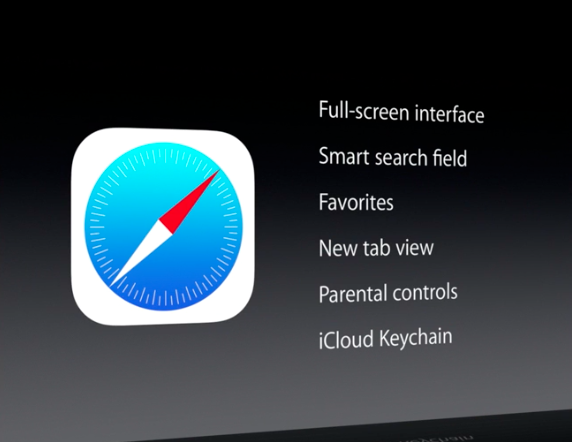 13:37 Safari will no longer be limited to just 8 tabs. 13:35 Finally, Safari is getting full-screen mode in portrait mode and a new tab UI, similar to that of Chrome Mobile. 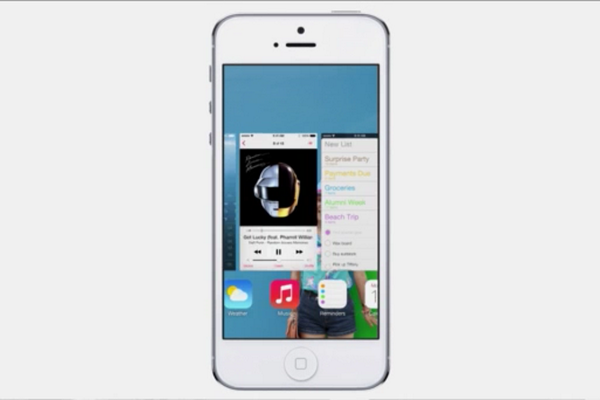 13:34 iOS 7 will also have a beautiful new multitasking interface. 13:33 All apps will now support multitasking! 13:32 All system toggles will be easily accessed in Control Center - just swipe up from the bottom and there they are. 13:30 "Installing iOS 7 on your phone is like getting a new phone." 13:30 Notification Center is available from the lockscreen, as in Android. 13:28 Super-beautiful weather animations in the Weather app. 13:26 New lockscreen, animated lock and homescreens, 3D parallax effect in home as you move the device around. It looks super cool. 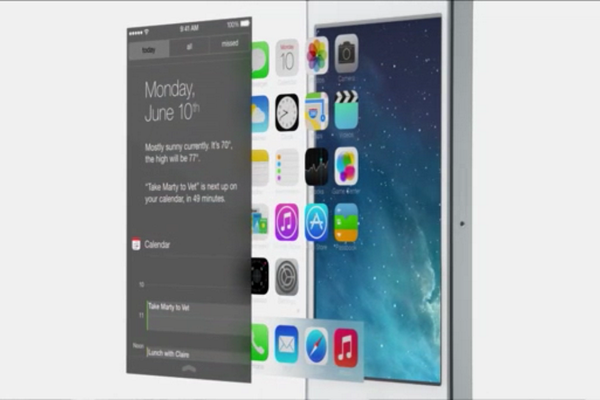 13:24 Craig Federighi is on stage to talk us through the new iOS 7. 13:23 Wow, the audience is standing, and cheering at the new iOS, Tim Cook is so happy. 13:22 A lot of new stuff guys, detailed look at it is coming. 13:19 They are rolling a video to talk up the new design. Narrated by Jony Ive, of course. 13:18 "It's packed with amazing new features and a stunning new UI." 13:18 "The team at Apple has been working incredibly hard on the latest version of iOS" iOS 7 is here! 13:16 Tim says that people are incredibly satisfied with their iOS devices. Statement is backed up by multiple surveys. 13:14 Phone usage, as well as web share statistics show that people use the iPhone and iPad much more than their Android devices. 13:13 600 million iOS devices sold thus far. Images courtesy of The Verge. Yes!!! The greatest mobile OS gets even better. Troll, no one have said anything about iOS yet. That's a matter of opinion, not fact. You should specify what's your opinion and what's fact when you comment, some people might be mistaken. Where can I stream this event.? http://www.apple.com/apple-events/june-2013/ But at the moment I see just this: "Available shortly. Please check soon." iOS 7 is very good looking.Awesome design!!!!! Android is dead. Seriosly,a beautiful UI with the speed/stabiltity/apps quality=iOS is just perfect! For once Apple's UI is up to my expectations: It's as ugly as the company Tim Cook made it to be after Steve's death. "Installing iOS 7 on your phone is like getting a new phone." On Android, we call those Launchers. Search for 'em on Google Play. There's a blue-million of them. Android wont die cos there're still lot of poor people in this world..
iOS 7 is sounding good, cant wait to check it out ...damn work!!!! It's sad when even several of the "features" are compared to what Android already has, lmao!